Do you battle with the removal of persistent spots, water streaks and dust build-ups from your windows? Do they cost you too much elbow grease and you have no will to engage in this chore? This activity will no longer consume a big chunk of your time and energy! The professionals of window cleaning in Cricklewood are going to give you a hand! You will be able to use your spare time as it fits you – the fully instructed and dependable professionals will take care of the wiping and polishing. We provide thorough cleaning services for all kinds of windows. Read further and find out more about the different perks you can have. We also provide our professional services in nearby areas: Childs Hill, Queens Park, West Hampstead, Kilburn, Willesden. You can depend on the team - they are one of a kind experts of window cleaning. They all have gone through diverse training, so you can receive top-notch service for all window types. What we can clean includes: small, double, garden windows, bay or sash windows, French doors, patio doors, conservatories and skylights. Your property can become better instantly with our aid. Get in touch with us any time you need efficient window cleaning for your home or office. Improve the look of your property – the professionals of commercial window cleaning will see to that. As part of our exceptional technique, we use water-fed extension poles. With this technique, we can clean completely the windows of your business premise, as high as the fourth floor. To reach higher windows we use rope access. We grant your glass panes will look perfect, regardless the high of the building. With the assistance of the squad of experts London's skyline is never going to be dusty. We use advanced techniques of window cleaning to ensure you will have excellent end results. With our water fed pole cleaning system, high pressure cleaning and rope access equipment, you can rest assured that your property's glass surfaces will be crystal clear. Besides that, your house is in good hands – the cleaners are absolutely insured and carefully trained. The water fed poles are linked to water supply tanks, while our rope access ensures safety – even when we clean tall buildings. You can profit from these techniques today – dial 020 3746 3113! 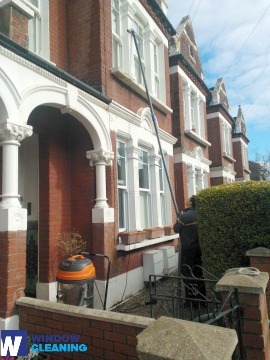 Benefit with our swift and reliable domestic window cleaning in Cricklewood. We can clean the windows of your home inside and out. The solutions we use are safe - you will have the great results and be ecologically responsible. Furthermore, we use only purified water. Don't hesitate, dial 020 3746 3113 and order our second-to-none services. Our customer service agents will take care of you – they are active 24/7. We have other ways of booking – our request a cleaner online form or just chat with our operators.